New Minecraft LEGO Set Coming in June? Can't get enough Minecraft? Need something more to round out your incredible Minecraft LEGO collection? If you have £170 to burn, consider grabbing this LEGO Village set, coming out some time in June of 2016! The set will have around 1600 pieces total, and as the picture above shows, a diverse set of biomes to choose from. Any existing sets should mesh nicely here! Additionally, the set is expected to come with a pair of villagers, Steve and Alex, a zombie, a creeper, an enderman, and to protect the village, an iron golem. One stand-out is the trading post - which in-game villages don't have - which is meant to visually represent how villagers trade in-game. £170 (around $244 USD) is a bit pricey, but if you are looking to round out your Minecraft LEGO set, this is definitely a must-have. Keep an ear to the ground in June! Location: I the cave. MINING! Would be very cool to see villages get little trading tents like in this set. Honestly, villages could just a major overhaul altogether. Well, it's Lego and Minecraft. Two insanely popular things among parents and children alike. It's bound to sell pretty well, no matter how overpriced those plastic bricks are. "Overpriced" is subjective. LEGO bricks are really high quality, so much so that even parts from 40 years ago still hold up and work flawlessly with modern parts. No other brick system can say the same. So you are paying for the quality, and if necessary, the service. Ive been buying legos for 20 years and have never, not even once, been missing a part. But if you are, they will ship the replacements to you, no questions asked. So yeah, LEGOs are pricey, but worth the cost, IMO, given the quality product you get. I wouldn't exactly call them top notch quality. I've had a few sets here and there in the past where most, if not all the blocks or mini-figures are faulty or just loose. Such as them not fitting together somehow, the blocks/limbs being loose to where they wouldn't stay together/wouldn't stay in place respectively. So usually they are decent quality. Surely a lot more than some of the unnoficial sets you'd see at the dollar store for much cheaper, but nothing too impressive. Of course you'd have some faulty sets or blocks here and there, but even assuming every single block is truly beautiful quality, I still don't think a set of plastic bricks are worth this much. 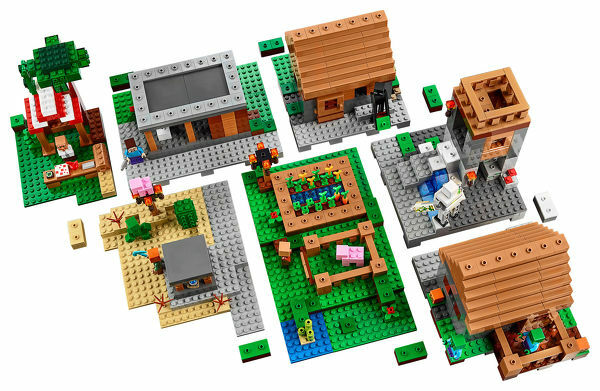 After looking at what this set features (Some parts of the village can turn into other parts such as being able to replace the house with a wall, and that you can actually move part of the houses to look inside) the price seems a bit more reasonable, but I feel it's still high up there. I don't know, I just feel it's weird that plastic is priced at this much. MegaBlocks are cheaper and have all of the benefits that you listed for LEGO. Unless this set has over 2000 pieces then it is not worth the 200+ price tag. All small LEGO bricks cost 0.10 cents each directly from LEGO. The fact that they increase the price of them in box sets like this is nuts. Megablocks use cheaper plastic and are not guaranteed to last nearly as long as LEGOs. That is included in the pricetag, along with licensing costs, and marketing costs. Yeah, sure if you buy all the parts individually it will be cheaper, but box sets are not listed at a production cost value. No product is. ALL products have markup on them for these reasons. Megablocks is a cheap alternative, and you get what you pay for. Cheap parts that can bend and break, or hell, even be malformed due to a cheap molding process. I've had such parts. Yet in 20+ years, never once has a ego par broken nor been missing from a set. Standard LEGO block are valued at 10 cents and that is including markup. That is only the markup for "This is a LEGO part", but nothing for licensing fees. At 10 cents a part, the set would cost, roughlt $160 for parts alone, but that is not a flat rate per part. A 2x4 brick costs 30 cents each, and Minecraft sets have many of them. Not to mention specialty parts made just for the Minecraft sets. Those can drive up costs too. Plus, the price for this set is likely to be more like $200, making the markup not quite as much. Nice set, bad price. I see people just saving up a little extra cash and buying a 3d printer. Or maybe that's just what I would do if I had the funds. It's too bad that this world is full of spoiled children, their parents are gonna buy these kids a bunch of overpriced plastic blocks. They should have split the building up into sets of like 2 buildings each so you could mix and match and customize rather than needing to buy them all in one shot. Awesome set, but almost $250? No thanks. $244 is WAY too much for a Lego Minecraft set. If a Lego fan wanted to spend that kind of money, there are far nicer, more detailed sets. You could almost entirely replicate this set with a big box of basic bricks. As much as I like Minecraft, Lego Minecraft always seems to be a ripoff. It's got specialized minifigs, but the rest of it is so plain. Lego is crazy expensive, although it always has been. I'm skeptical on this set. It would seem much better in the 110$-120$ range, about 50 bucks more than a regular 1600 box set. I know some new blocks were made for this, but that doesn't seem to support almost a 200 dollar mark-up. Wow that price. I remember when good sets were $20 and now their like $40. One of the reasons I don't buy Lego sets anymore. Who in their right mind would buy a pile of ******** plastic for 240$ ****** dollars? It would be cheaper for me to use a Mirco 3D printer and print my own bricks. The coils are cheaper for printing are cheaper than this lego set by a long shot.